UFood Grill’s New CEO is Counting On A Better Executive Team And A Health-Focused Concept To Revive The Franchise. Resurrecting a restaurant brand poses many of the same challenges as starting from scratch. The menu must be rebuilt, the executive team put in place and a market strategy developed. But the brand must also prove it has corrected the problems that stymied the company the first go-around and find franchisees who still believe in the product. It’s a challenge that the new UFood Grill is embracing in its attempt to regrow its healthy fast-casual concept. UFood Grill CEO, Salvatore Rincione knows that he must build those relationships with franchisees to get the UFood Grill revival off the ground. “I treat my franchisees like family,” he says. Rincione’s experience as a vice president at Red Mango, Five Guys and Planet Hollywood taught him to be accessible with franchisees, a lesson he is taking to heart with U Food Grill. With the first dozen new UFood Grill locations, Rincione will personally work with franchisees on site selection and build out. Rincione considers himself an unorthodox CEO because of his hands-on approach. He says the relationship with franchisees is comfortable and natural. Some franchisees even call him up just to talk football. “We’re really on a first name ‘hey, how’s your family doing,’ let’s send you a bottle of wine in the mail type of relationship,” Rincione says. The original UFood Grill was conceived as an alternative to greasy, non-nutritious fast food around 13 years ago. Back then, the Massachusetts restaurant was named Lo Fat Know Fat and developed a cult following of health-conscious eaters. Its low-salt, low-calorie menu featuring bison burgers and other lean items caught the attention of Boston Market founder George Naddaff, who purchased the company in 2004 and changed the name to UFood Grill. Naddaff began franchising the brand and it quickly grew. Although the restaurant had its fans, healthy and natural food trends had not yet taken hold. The initial incarnation of UFood Grill did not find the success its leaders envisioned and in 2012 the company went bankrupt, closing most of its stores. Rincione’s company, Healthy Acquisitions, saw in UFood Grill a restaurant that had a good concept but was ahead of its time. In October 2013, Healthy Acquisitions purchased the assets and took the UFood brand out of bankruptcy. In March 2015, Rincione quickly went to work on rebranding the restaurant with a new logo, website and executive team. The new UFood Grill is retaining the restaurant’s core philosophy of healthy eating. No item is more than 700 calories, nothing is fried and no genetically modified organism (GMO) products are used. 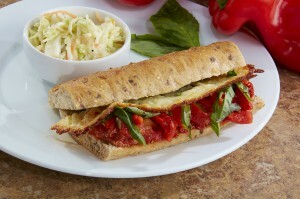 The menu features grass-fed steak, free-range chicken, shrimp, turkey-made sauces, and vegan and gluten-free options. Executive Chef Philip Kafka, a graduate of Le Cordon Bleu in London and Johnson & Wales University, develops the menu, which is then tested by focus groups. “We’re very keen to what the customer wants,” Rincione says. The customer also wants confidence that no matter which UFood Grill locations he or she goes to, the food will be the same. UFood Grill uses ChefTech, software that tabulates recipes down to the grams of sodium, to standardize its products and improve consistency between stores. Sysco supplies much of the proprietary food that makes up UFood Grill’s menu. NPC Processing out of Burlington, Vt., provides all of the proteins, which are customized directly for the UFood brand. This allows UFood Grill to control the quality of the meats its customers demand. The restaurant also seeks out produce farmers within a 25-mile radius of its locations. “The menu that we are serving to the public is actually second to none,” Rincione says. As it reopens brick-and-mortar stores, UFood Grill will gear its menu to local flavors, offer limited-time items and test different products. “Menu innovation is a living, breathing thing,” Rincione says. 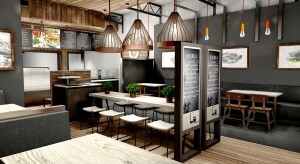 UFood Grill’s new concept stores feature a modern look with natural food features. Locations will be equipped with the latest customer conveniences, such as cell phone charging stations and self-serve kiosks. The company is also developing a mobile application and plans to offer online ordering and delivery. The company currently has 16 locations in 12 states, predominately located at Air Force bases, college campuses and airports such as Boston’s Logan International Airport, Dallas/Forth Worth International Airport and Salt Lake City International Airport. Rincione’s plan is to use franchisees to rebuild UFood’s brick-and-mortar presence, similarly to how he took Red Mango from 12 locations to more than 350. To accomplish that, Rincione is treating UFood almost like a new brand. “I called this the oldest startup I’ve ever done,” he says. The first new franchise location was sold last October. By the end of 2016, Rincione expects to have four street stores open in Maryland, Boston and New York. “We have a very laser-focused development plan,” he says. The goal is to reach 100 locations in the next seven years. Rincione expects the primary growth markets will be Dallas, Houston, Florida, Maryland, Virginia, New York, Boston and New England. “We’re going to be focused on the development of where we put these things,” Rincione adds. 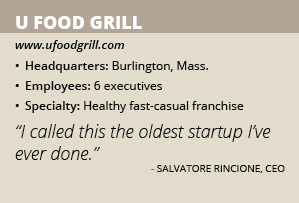 Rincione says one of the reasons the original UFood Grill struggled is that the company had a lot of disjointed growth. The reincarnated franchise will focus east of the Mississippi, enabling the executive team to better oversee the brand and make distribution easier. UFood Grill will also stress standardized operations and procedures. The executives now guiding UFood Grill’s future will be one of the most significant difference-makers. Rincione retained only two of the old company’s leaders, CFO Irma Norton and Vice President of Real Estate and Construction Walter Pomerleau. The rest of the team is new to UFood Grill, but experienced in the franchise restaurant industry. Director of Operations and Training Kathryn Kaufman is a veteran of Red Mango and Shake Shack and Vice President of Franchise Development Bob Dibartolomeo previously worked with Rincione at Red Mango. Executive Chef Phil Kafka has previous experience with Cosi and Dunkin’ Donuts. “We have a really great executive core staff that really understands the core of franchising,” Rincione says. Potential franchisees should be people with a passion for the UFood Grill brand, business acumen, previous restaurant experience and a willingness to follow systems, Rincione explains. If the franchisee doesn’t have a restaurant background, Rincione says they must bring in an experienced food industry professional to run the day-to-day operation. “One big thing I tell the franchisees is you’re in business for yourself, not by yourself,” he says. The only way UFood Grill corporate is successful is when its franchisees are successful, he adds. To ensure that success, UFood Grill plans to work closely with every location. “From the time you sign your franchise agreement to when you have your grand opening, we’re going to be with you the entire way,” Rincione pledges. The company helps with site selection to ensure not only a successful location, but also that stores are spread out and won’t saturate the market. Rincione is exclusive with real estate brokerage firm Sites Matter, which is headed up by John Keiser. Sites Matter specializes in complete analytics for quick service restaurants. Additionally, UFood Grill corporate will support local marketing by earmarking 2 percent of each store’s sales for a fund that directly supports advertising the franchisee’s individual stores. The fees to open a UFood Grill location can run between $430,000 and $643,000 for a typical 1,800-square-foot restaurant. That fee includes the total development cost, from building the structure to purchasing equipment and marketing. A veteran himself, Rincione hopes UFood Grill will attract former military members. The company is an affiliate of VetFran, an organization that links service men and women with franchise brands. UFood Grill is offering a 50 percent discount on the franchise fee for any veteran interested in opening a location.